In a rematch of last year’s Metro Atlantic Athletic Conference tournament championship game, the Quinnipiac men’s soccer team played to a 0-0 draw against the Monmouth Hawks on Saturday afternoon at the QU Soccer Field. With the tie, the Bobcats remain undefeated in conference play. In the first half, both Monmouth and Quinnipiac combined for a total of two shots, with both Quinnipiac goalkeeper Borja Angoitia and Monmouth goalkeeper Eric Kienofsky making big plays to keep the match scoreless. Angoitia made a diving save to keep the Hawks off the board in the game’s first five minutes. In the 19th minute, Klenofsky answered Angoitia’s impressive save by making a diving save of his own during a one-on-one chance for the Bobcats. Angoitia made another big save in the 65th minute when he stopped a shot from Hawk’s senior forward Dom Sarle with his body. The senior goalkeeper then batted away a corner kick in the final minute of regulation to keep the match scoreless. 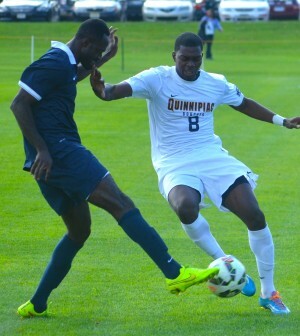 Quinnipiac forward Machel Baker had two scoring chances during extra time, but couldn’t find the back of the net. The first of Baker’s chances came in the first half of extra time when he kicked the ball over Monmouth’s empty net. Baker then kicked the ball just wide of Monmouth’s goal near the game’s end. And though the match ended in a 0-0 tie, Angoitia said the team remains confident in its ability to put the ball into the back of the net. Quinnipiac plays again on Wednesday at home against the Manhattan Jaspers, who are winless in the conference and only have one win this season. Kickoff is set for 4 p.m.